One of the best elements of home baking is the freedom and scope of trying out breads from different parts of the world. It is like an adventure…trying out different ingredients, flavours, tastes and textures. 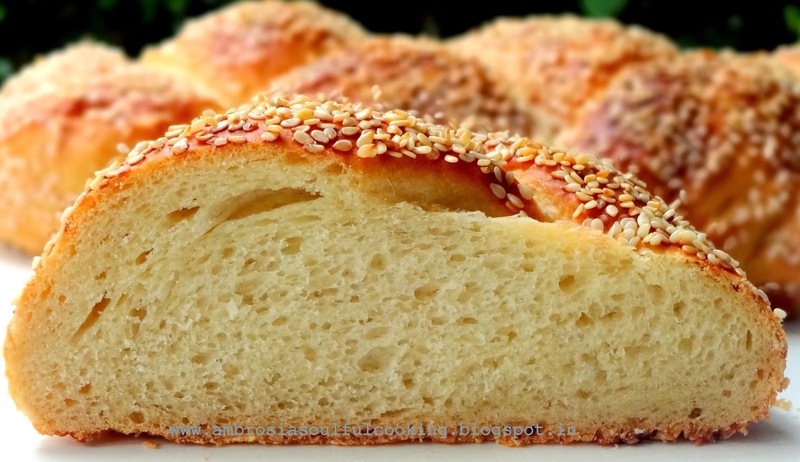 Every baking sessions leaves you enriched and also with a craving to try out more….. During one such baking adventures, I baked Scali Bread. 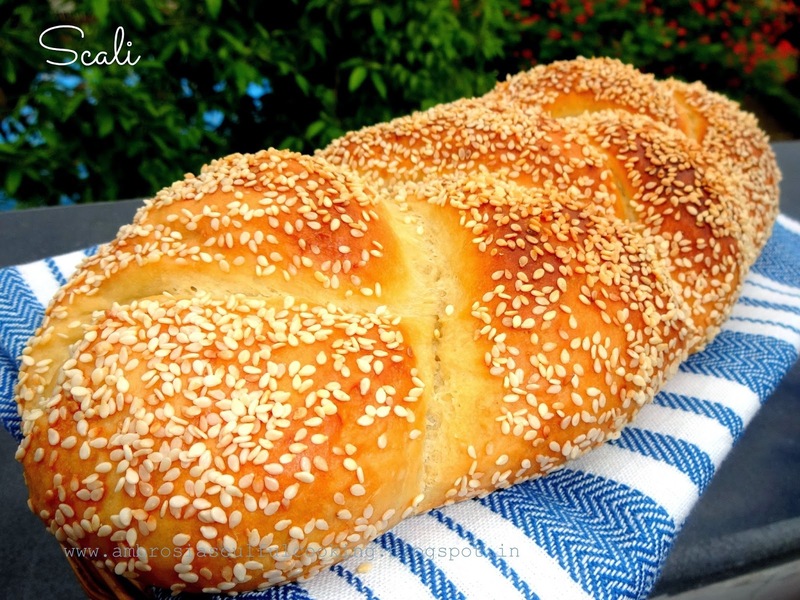 Scali bread is a long braided bread, covered with sesame seeds, traditionally made with a preferment. The bread has a soft white interior with a chewy brown crust. Pronounced as “skah-lee”, this bread, is ideal to serve along with dinner or have it with stew or soup. The credit for this bread goes to the Italians who settled into Boston’s North End where it is sold and enjoyed as a daily bread. I used milk wash in place of egg wash. The bread had soft crumb. Sesame seeds added crunch and nutty flavor. Mix all the ingredients of starter and knead a stiff dough. If the dough feels too dry, add more water. Cover and let rest at room temperature overnight. Prepare dough by combining the starter with the ingredients of the dough. Knead for about 8 to 10 minutes till you get soft elastic dough. Place dough in a greased bowl. Cover and let it rise for 1 ½ hours or till the dough doubles. Grease your hands and roll each dough into a rope about 24 inches long. Brush each rope with milk wash. Roll the ropes in sesame seeds. Take one end of each rope and squeeze them together firmly. Braid the ropes. Tuck the ends under. 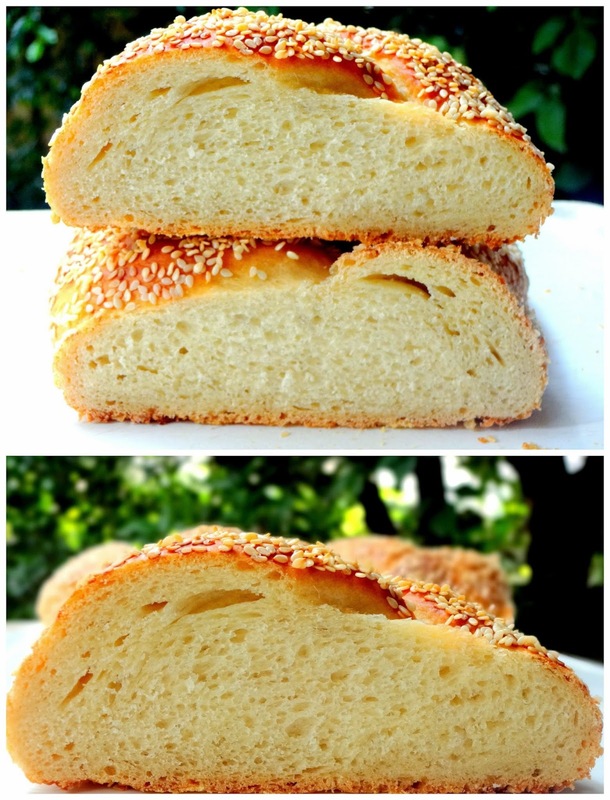 Sprinkle the braid with remaining sesame seeds. 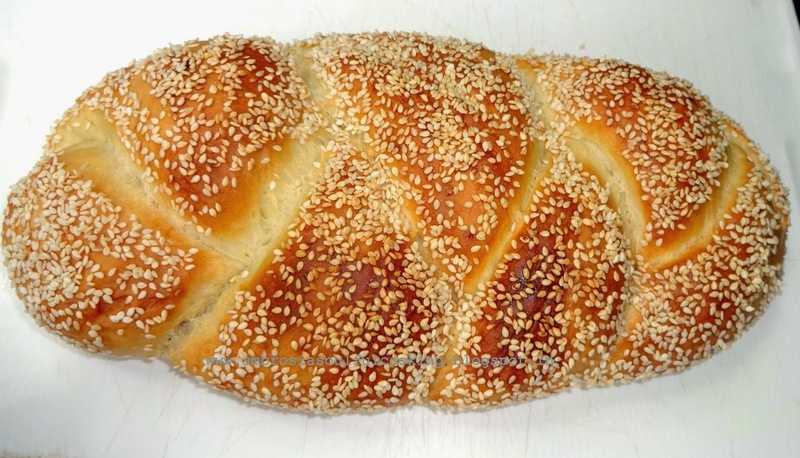 Place the braided loaf on a greased baking tray. Cover with a kitchen towel and let it rise for another 1 ½ hours or till very fluffy. Preheat the oven to 220 degrees C. Bake the loaf for 25 to 25 minutes or till the top turns a beautiful golden. Remove from the oven. Cool on a rack.